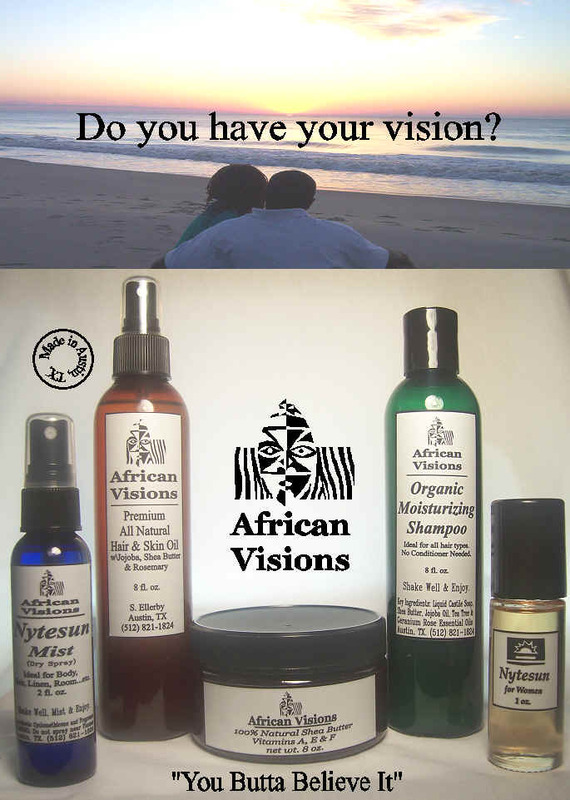 African Visions - Handmade Natural Unrefined Shea Butter, Raw Black Soap, Organic Shampoo, Safe for Sensitive Skin. *Offer is for retail orders only and is currently for customers in Texas, Louisiana, Arkansas and Oklahoma. All other shipment areas are based on USPS shipping rates. Delivery options are available in the Austin TX metro area. To order any of our wonderful shea butter based products, scentful mists or body fragrances email us at: info@youbuttabelieveit.com or call (512) 785-7051. (FYI - If you do not have Outlook or Outlook Express setup on you computer, to email us you may need to login to your web e-mail account then create an email and copy/paste or manual type in info@youbuttabelieveit.com).